Mahabharata’s great war was over, peace was restored and Pandavas started ruling the Kingdom. In spite of immeasurable human loss, common people were relieved from the turmoil. Peace and prosperity was slowly restored and life took its own speed. Meanwhile Lord Krishna and Yadavas had migrated to Dwaraka and people were enjoying the Lord Krishna’s regime. The main task of guiding dear friends Pandavas, destroying the evil powers of Kauravas was completed successfully and ‘Good over Evil” had won as per universal law. The greatest wisdom to the human kind-“The Bhagvad Gita” was narrated by Lord Krishna explaining the theory of Karma, rightous ways of life, one’s own duties and Faith in almighty was extremely important gift! Great souls take birth to fulfill the mission of human welfare and once fulfilled, they depart in most dignified way , for further task to uplift the mankind . Lord Krishna decided to end his Avatar on this earth. He chose a place slightly away from Dwaraka , near Prabhas pattan. Krishna went to a forest and started his “Yoga-nidra”. He had planned in such a way that it would look like an end of a normal human being. Krishna started taking rest under” Yoga-nidra” – a meditative phase where soul is in the process of leaving from mortal body ! He had taken support of a tree trunk and lying on a grassy ground resting one leg on another. Total silence was ruling over in the forest .The moment had come! Jara was a hunter from “Bhilla” tribe whose livelihood was from hunting. At the same time he too was set for hunting and was determined to get a prey to feed his family on that day. He carried large bow and his arrows were coated with deadly poison. The intension was that in case the prey escapes it will die due to poison after some time. Jara was cautious and was slowly moving towards the forest. He was extremely careful of not making any sound. While moving slowly forward through the dense forest , something attracted his attention. He was excited as the prey was within his reach. He maintained utmost silence to observe – it looked like an ear of an animal –most probably a deer. Wow ! It was a great target as his arrow would directly hit the head of the animal. He was very pleased and stretched his arrow upto his ear and held in correct position. The thread of bow was stretched and focus was intensified. Everything was happening as per plans of destiny. The target did not move and hence this was a right moment. Next moment the arrow left the bow and reached its target! Jara was happy and followed the direction of arrow. He heard a sound of a human being . When he reached the place , he had a shock of his life! It was not any animal but it was a heel of royal, elegant and divine looking person. He was extremely handsome man with mysterious smile on his face. He could not understand how his judgment went so wrong. Jara recognized Lord Krishna . He was extremely sorry, shocked and stunned. The heel was stuck with arrow and bleeding. Lord Krishna did not show any anger or pain but got up and sat. Jara fell on his feet and started crying uncontrollably for his grave mistake. Lord got up and held Jara and blessed him. 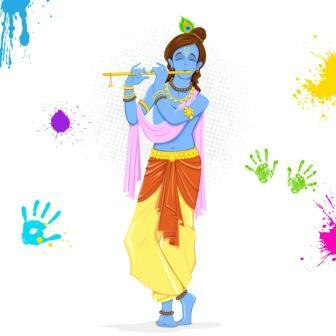 Krishna assured him that he was not a guilty at all .He had followed his profession. Krishna gave him assurance that it was the time for him to leave the mortal body and some reason was required to happen it. He consoled Jara and blessed him that he too will be remembered forever. Such is the gesture of Lord! Krishna got up and did his own rituals to leave the human form. Meditation was at its highest peak and slowly with greatest poise the almighty discarded human form, blessing the entire human race – assuring that he is “ Anadi” ( one who does not have beginning) and “Anant” ( permanent and endless) and will be there to protect righteousness whenever required. The greatest Yogi reached his goal , the goal of “mahasamadhi”. The body became calm, brightest and divine smell filled in the atmosphere. All birds and animals became silent. The soul discarded old clothes ……. to re-enter in another ! By the time people thronged and started wailing. Big brother Dauji alias Balaram arrived and understood the entire situation. He too took decision and went to a cave which was deep and dark and achieved his end. This beautiful transmission is a demonstration of total detachment from the worldly affairs. Above that he has already promised that “Yada Yada hi Dharmasya , glanirbhavati Bharat, Abhuthanam dharmasya tadatmanam srujahamyaham”. He has kept the promise by reincarnation in the form of Bhagwan Buddha and Bhagwan Mahaveera. In Kaliyuga he destroyed Osama Bin Laden by Obama! Balaram alias Dauji ki gufa (Cave of Balarama) is nearby and one can visit it. A big idol of “Shesha” is there. The moral to me that one can manage his own end cautiously! I think this is the tremendous power of Yoga . Lord demonstrated it to entire mankind that end of body is not a end but actual unification with the highest energy .The soul goes to its origin. Soul is immortal, hence there should not be grief over the transition. The original name of the place is “Bhilla ka tirth”. The word Bhalka is a slight variation of a word Bhilla – a tribe which are basically hunters. Today also Bhillas are in Maharashtra, Madhya Pradesh, U.P., Gujrath and Karnataka. Same way we can meet many Yadavas alias Ahiras in Gujarat. They claim that they are direct descendants of Lord Krishna. This place is on the way from Veraval to Somanath .It is five kilometers from world famous Somanath temple . The water body where Krishna removed the arrow and did his own rituals is known as “Bana tirtha”. The whole place is divine and leaves everlasting impression of happy and immortal Krishna! Usha Shinde has worked as Public Relations Officer at Bangalore Institute of Oncology, as Chief Counsellor at Manipal University. etc. At present she is working as Manager- Customer Relations at Bhagawan Mahaveer Jain Hospital. Her qualifications are B.A. (Economics) ,M.A. (Literature) and a P.G.Diploma in Public Relations. She was trained in Counselling by” Viswas” and by WHO doctors and nurses.